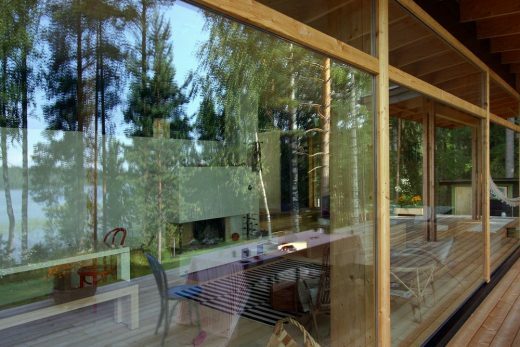 Built on the shore of a beautiful lake in central Finland, Villa Kaislaranta blends into its surroundings by using inconspicuous massing and a well balanced combination of reflections and wood cladding. A recently retired couple wanted to build a summer villa that would reflect their aspiration for enjoying the beautiful lakeside landscape with their extended family and friends, while at the same time minimising the impact of the construction on the surrounding natural environment. 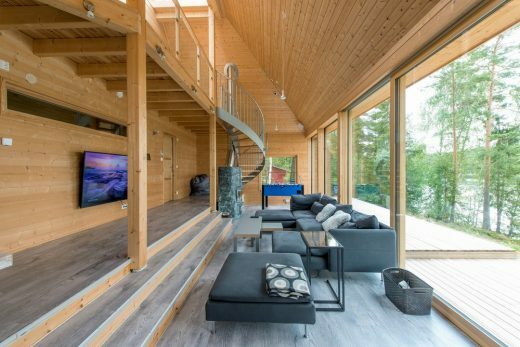 The architectural solution was to visually blend the dark wooden facade with the forest background and use large glass surfaces to both provide spectacular views to the lake and blend in the building to the surrounding nature with reflective surfaces. 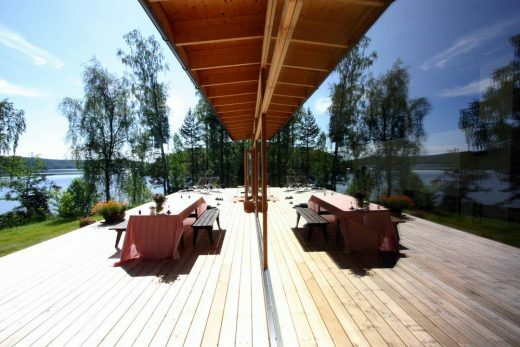 Moreover, the lake facing facade was made shorter than the opposite side in order to minimise visual impact toward the lake. 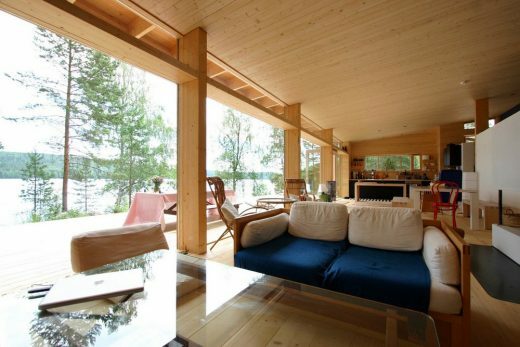 Large, well detailed windows towards the lake make people in this villa feel like a part of the nature around them. The glazed East facade works as a mirror-like surface absorbing the atmospheric views of the lake and creating an all-encompassing natural environment. Generous naturally aged wooden terraces surround the villa for comfortable use of outdoor spaces. The interiors are structured based on an effective and rational floor plan that makes the most of the eastern views towards the lake. It was necessary to have enough space for many people to spend the night, so the bedrooms are designed to sleep up to four people on two levels each. The main living areas on the lake side were designed with open space concept – to provide a fluid space for different usage according to need. A long built-in bookshelf and corridor to the bedrooms divides the space into private bedroom area and entertainment sector. 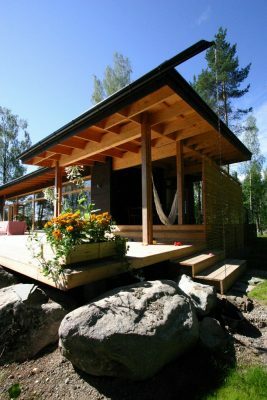 The main space continues visually to a large deck area outside providing a strong connection to the nature outside. 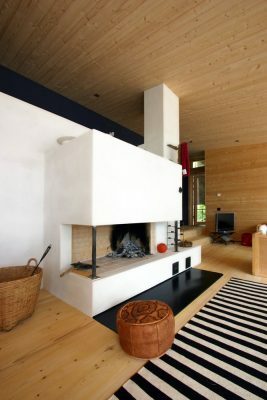 An imposing fireplace dominates the living area, which combines conversation and dining areas with the kitchen in an open space plan arrangement where activities are free to flow. 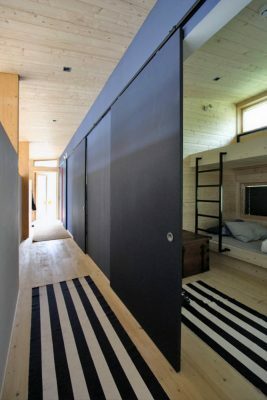 The aim was to design a vacation house that the family could use all year round. Morning views to the lake were a must in this amazing landscape of central Finland. 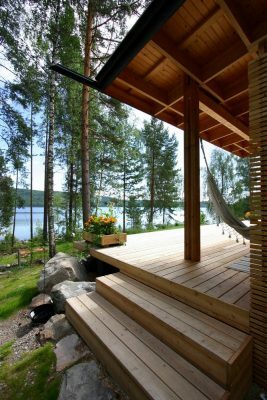 Outdoor spaces were also very important for the family – the long and light days of the short Nordic summer are best spent outside, rain or shine. The architects wanted to preserve the pristine lake surroundings from too many manmade visual intrusions. The challenge was that we wanted to design enough space for the extended family and friends to visit but at the same time keep the facade and volume toward the lake to a minimum.